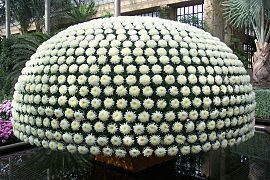 Longwood Gardens have evolved into one of the premier horticultural display gardens in the United States. The history of the gardens, can be traced back to the beginning of the 18th century. Today, the more than 1,000 acre estate (436 hectares), features endless beds of flowers and exquisitely maintained grounds, featuring 11,000 different types of plants. These marvelous gardens are our fourth stop in Off The Beaten Path. 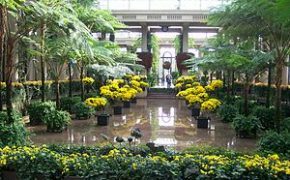 Having explored Mesa Verde in Colorado, and making two excursions in Arkansas, one at Blanchard and the other at Crystal Bridges, travelers should now consider a trip to Longwood Gardens. 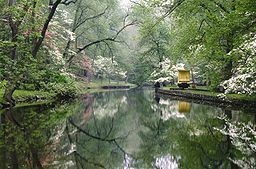 These magnificent gardens are located in Southeastern Pennsylvania within the Brandywine Creek Valley. Longwood Gardens has attracted more than one more million visitors annually since 2012. Our story begins, on land owned by William Penn, the founder of Pennsylvania. George Peirce would purchase 402 acres from representatives of Mr. Penn in 1700. One of his sons named Joshua, built the brick farmhouse in 1730. It still stands today, though it has been somewhat enlarged. Peirce-Du Pont House, currently a museum. Twin great grandsons,both who pursued an interest in natural history, began planting different varieties of trees in 1798, that would eventually cover 15 acres. The collection included individual specimens from North America, Europe and elsewhere. 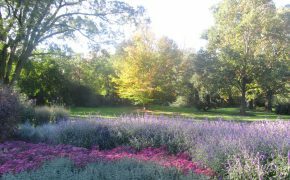 By the middle of the 19th century, the Peirce Arboretum was one of the finest collections of trees in the United States. At this time,the local citizenry began to use the grounds for public events. Towards the end of the century, the family was no longer maintaining the property. In early 1906, a lumber mill operator was contracted, to remove trees from a 41 acre section of the estate. It was this pending action, that prompted Pierre du Pont to purchase the entire property. The du Pont wealth permitted a major expansion of the grounds. What visitors see today, is largely based on the creativity and imagination of Pierre, in his new vision of what would become Longwood Gardens. There was no grand master plan, but he would later draw heavily on French and Italian garden designs. Pierre would refer to the property as Longwood. The name came from the nearby Longwood Meeting House, which in turn was titled after a nearby farm named Longwood. The original use of the name was probably derived from a nearby expanse of forest, referred to as The Long Woods. The following year Mr. du Pont would lay out the first garden, a 600 foot long bed that would become known as the Flower Garden Walk. 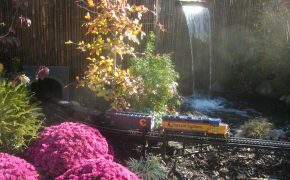 It remains one of the most popular attractions at Longwood even today. The first fountain at Longwood would be constructed in the center of the walk. The beauteous effect of the Flower Garden Walk in the springtime, prompted Pierre to begin hosting garden parties in June. As one of the highlights of the social season, it also encouraged the entrepreneur to attempt even more natural extravagance at Longwood. One result would be the Open Air Theatre, that would come into existence as of 1912. Pierre had been inspired from a similar facility near Siena, Italy. Within a year, he equipped it with secret fountains that shot out of the stage door, to drench visiting family members. In 1915, Pierre would build an extension onto the original Peirce house and connected the new wing with the old one through a conservatory. It would become Longwood’s first winter garden. It would be quickly planted with exotic foliage, that became a favorite of the new Mrs. du Pont that same year. The following year, Pierre was contemplating the creation a much larger indoor garden installation. In 1921, the remarkable Conservatory would be inaugurated. The latest technology was used to heat the water and power the facility, but it would all be hidden, so as to not distract from the grandeur of the place. In 1923, an elegant Music Room with a massive 3,650 pipe Aeolian, was built opening onto the main greenhouse. A Steinway Grand Piano would be purchased the same year. In 1930, Pierre would engage the construction for the largest residence organ in the world. This would be the 10,010 pipe Aeolian organ. This famous instrument was placed in the Ballroom. Today, it forms the cornerstone, to the resident performing arts program at Longwood. Of course, Mr. du Pont allowed the public, access to all these wonders and they came in droves to experience it. 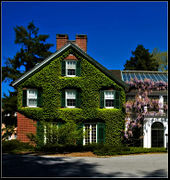 Numerous social and civic events would be staged on the premises, adding to the fame of Longwood. From 1925 to 1927, a Water Garden would be constructed in a low lying area. It can be found northeast of Longwood’s Large Lake. This feature was inspired by the Villa Gamberaia outside Florence, Italy. The version designed by Pierre would have 600 jets in nine separate displays, that shot from six blued-tiled pools and 12 pedestal basins. Also installed was a 40-foot tall jet fountain, at the end of the central avenue of trees in Peirces’s Park. He then enlarged the Open Air Theatre and replaced the old waterworks with 750 illuminated jets. However, his masterpiece for hydraulic engineering, would be the Main Fountain Garden in front of the Conservatory. Here 10,000 gallons of water a minute, can be shot 130 feet in the air and may be illuminated in every imaginable color. Between 1929 and 1930, Mr. du Pont would commission the construction of a 61 foot tall stone Chimes Tower. It was based on a similar structure he had seen in France. In 1956, the original chimes would be replaced with a 32 note electronic carillon. In the year 2000, a new 62-bell carillon would arrive from the Netherlands. The completion of the fountains in the mid 1930’s, marked the end to major construction at Longwood by Pierre du Pont. Although he would later have built, a huge 30 by 36 foot oval analemmatic sundial at the end of the decade. It was to be placed in the Topiary Garden. The estate had grown from the 202 acres purchased originally by Pierre to 926 acres. This was accomplished by adding 25 contiguous properties. It permitted Longwood to be a functioning farm that provided food for the du Pont family and their many employees. Farming operations would later cease in 1951, except for the orchards and the growing of some vegetables. 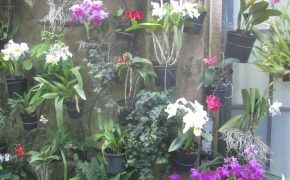 The gardens would be enriched, by the gift of a famous orchid collection from Mrs. William K. du Pont. 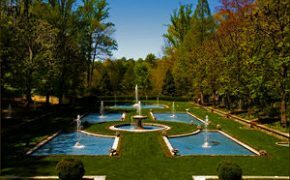 In 1946, the federal government gave approval for the Longwood Foundation, the charitable organization set up by Pierre, to operate Longwood Gardens. This was done to give the property tax-exempt status. Mrs. du Pont had died in 1944, and the couple did not have any children. Mr. du Pont himself, would die in 1954, at the age of 84. The foresight of Pierre left a well funded and adaptable model in place upon his death. Five very experienced businessmen who were his nephews, were already trustees of the Longwood Foundation. They would hire as the first director of the Gardens, Russell Seibert an experienced horticulturist and public garden administrator. He would soon embark on a new path for these now famous gardens. 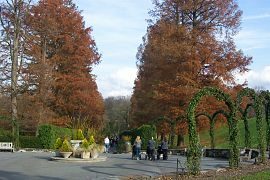 The 1950’s and the 1960’s brought enormous change to Longwood Gardens similar to the expansion that took place in the 1920’s. New gardens, a plant nursery, and an experimental greenhouse were soon established. Other greenhouses devoted to tropical plants would also be built including the now spacious Palm House. It contains over 60 varieties of palms. The late 1960’s saw the installation of the still popular Eye of Water and a more wild garden of 86 acres known as the Meadow, which the latter would finally be opened to the public in 2014. A Desert House and 13 outdoor waterlily pools, were also created. Brochures, guide maps and other publications were soon being produced. Along came a new visitor center, auditorium and a 1,000 car parking lot. Longwood Gardens would be added to the National Register of Historical Places in 1972. The house would be opened for guided tours in 1976. 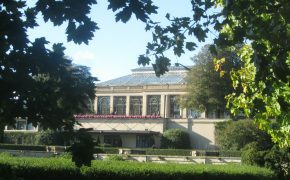 In 1973, the huge Azalea House now called the East Conservatory opened, which was a refurbishment of the 1928 structure. Two outstanding professional education programs were developed during this period. Graduate studies and a practical school for horticulture and floriculture. 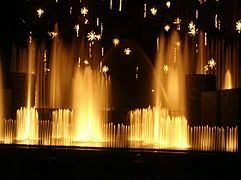 Fireworks with the fountains were first introduced in 1980, pre-ticketing became necessary by 1985, due to the popularity of the event. The Terrace Restaurant would open in 1983. One of the most popular events and one that has grown tremendously since the early 1960’s has been Longwood’s Christmas Display. Today as many as 300,000 guests enjoy the spectacular display of some 400,000 lights, 200 concerts and superb floral arrangements. In the 1980’s and the 1990’s new gardens include the Silver Garden, the tropical Cascade Garden, the Mediterranean Garden and the Children’s Garden. Two million minor bulbs were planted over a 20 year period starting in 1985, to create huge drifts of late winter and early spring color every year. Native azaleas and rhododendrons would be added to Peirces’s Park starting in 1989. A new distinction was then made between the original arboretum (the Park area) and the seven acre pleasure park, renamed Peirces’s Woods to the southeast. The biggest change in designation came in 1995. It was then that Peirces’s Woods was designed as an art form garden, that brought together the most ornamental characteristics of the eastern deciduous forests. The concept was to use native plants to create a woodland garden as an art form. The whole idea was new to Longwood and it would be among the first to try such a construct. Also in 1995, the Heritage Exhibit would open in the Peirce-du Pont House. Today Longwood Gardens has a staff of over 1,300 employees, students and volunteers. 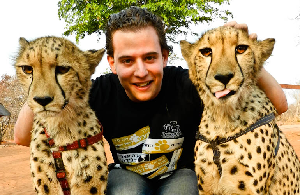 The Foundation manages a yearly budget of some $50 million USD (United States Dollars). The site is continuously evolving, to meet the changing tastes and demands of a new century. The contributors to these wonderful gardens are all part of the Visionary Master Plan, which is to keep and maintain the facility as one of the world’s greatest gardens. 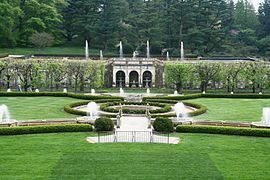 Longwood Gardens is located at 1001 Longwood Road, Kennett Square, Pennsylvania 19348. Their phone number is (610) 388-1000. Visitors will arrive using US Route 1, about 3 miles northeast of Kennett Square, Pennsylvania. 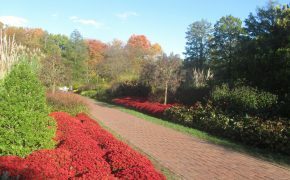 Longwood Gardens is located 30 miles west of Philadelphia. The museum is open daily for most of the year from 9:00 am to 6:00 pm. The cafe is open 10:00 am to 5:00 pm. There are a number of holidays where hours are more restrictive. Between Thanksgiving through New Years, hours are expanded to better enjoy the holiday displays. Different parts of the park may be closed for maintenance, upkeep and preparations for new displays, at various times of the year. The admission fees for the Gardens for most non-peak days, is $23.00 USD for adults. 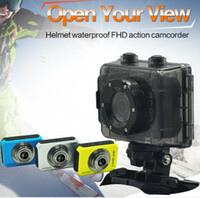 During the Christmas Season (peak days), this will rise to $30.00 USD. College students with valid identification are admitted at $20.00 USD and $27.00 USD respectively. Seniors (62+) are also admitted at $20.00 USD on non-peak days and $27.00 USD for peak days. Youth admission fees (from 5-18) are admitted at $12 USD on non-peak days, to $16 USD for peak days. Children ages 4 and under, are admitted free on all days of operation. *To receive a group discount there must be at least 15 members in your party. *Military personnel, both active and retired as well as their families, with Department of Defense identification, are entitled to a 25% discount off of the general admission. This reduction in price is only available on site. * Timed admission tickets are required for everyone and only a limited number of tickets are available at any given time. Especially if there is a special exhibition and during holidays, this writer recommends you purchase your tickets in advance or on-line. * It must also be noted, that all of the Gardens are considered a smoke-free environment. Is available in the town of Kennett Square and numerous nearby communities. Stunning pictures of garden! I found this blog very interesting. I will tell all my friends about it. Thanks for sharing this blog, great article and wonderful pictures. ← Next Post Things Not To Miss In Mexico City!